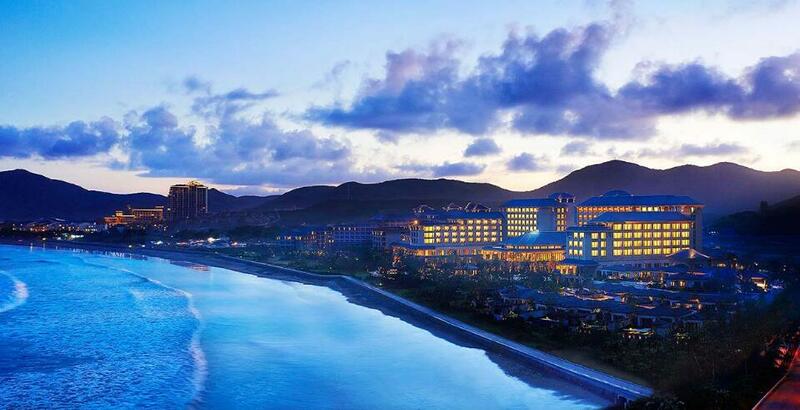 Westin Resort Hotel is located on the coast of East China Sea. It provides first-class facilities as well as thoughtful and meticulous Westin-branded services. The hotel is equipped with 263 comfortable guestrooms, suites and villa apartments with Westin-style Beds. Four dining halls and bars provide various food and beverage. Westin fitness center are prepared for tourists to exercise the vitalities of both mind and body. “Buddhist World amidst Sea and Sky and one of Buddhism’s Four Mountain Sanctuaries in China”. In a short distance from the shopping center and entertainment venues, Hilton Hotel provides fashionable and comfortable guest rooms, great facilities, as well as diverse restaurants and bars for dining. Address: No 777, Haizhou Road, Donggang, Putuo district, Zhoushan, Zhejiang province. The hotel boasts a convenient location, with a mere 20 minute drive to Zhoushan Mount Putuo Airport. The hotel is a 22-floor building with 398 rooms as well as 4 dining halls and wine clubs. Meanwhile, the hotel provides top notch facilities, including a gym, a SPA, an indoor swimming pool and an ecological corridor. The hotel is located in the center of Donggang of Putuo district. It provides 373 rooms, among which 108 are apartments featured with sea and Buddhist elements. The distinctive dining halls can accommodate up to 1,500 people at the same time. Various entertaining facilities are are also available, including SPA, KTV, sauna house gym center, beauty salon and swimming pool. Located in Mount Putuo and adjacent to the East China Sea, it is a hotel decorated with a classical and elegant style, including 238 delicate guest rooms. The unique restaurants and bars of different styles serve authentic local seafood, vegetarian Buddhism food, Cantonese cuisines, western and Asian delicacies. Moreover, gym, indoor and outdoor swimming pools, Spa and KTV facilities are also available in the hotel.